Less interested in painting us a pretty ocean scene, Mondrian preferred to show the nitty-gritty details and mechanics of how ocean waves break and move. In 1914, after a successful exhibition of the famous artist’s work opened in France, Mondrian was called back to the Netherlands to tend to his dying father. Once there, World War I broke out and any attempts to return to the land of wine and baguettes became impossible. C'est la vie! Though Mondrian was pretty grumpy about it for awhile, he eventually got back to painting and developed a new theme to preoccupy himself while he waited around bored: the sea and its relationship to the pier. 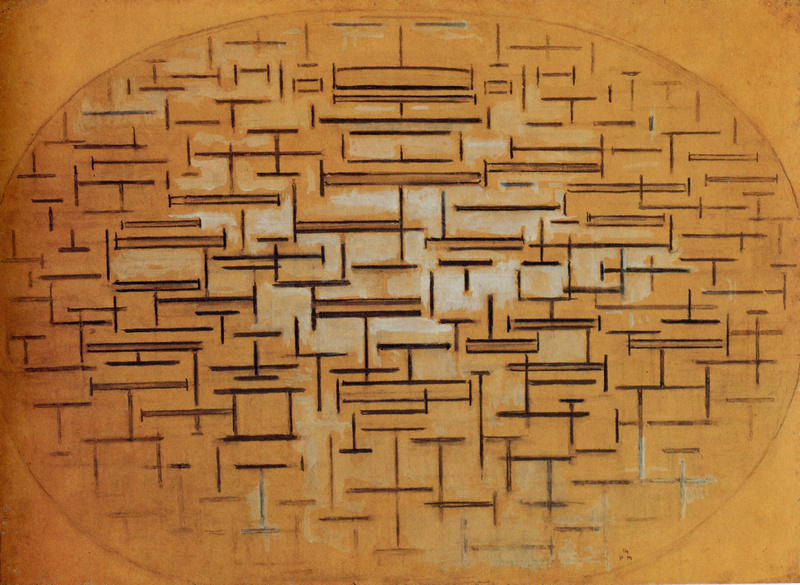 Piet “Pier” Mondrian (as I like to call him) took a few notes from the cubist painters of his time, including the oval format and grid structure commonly employed by the movement. But for Mondrian, these elements had the opportunity to be “spiritually” principled, seen as reflections of the natural world: the crisscrossing lines and borders become, suddenly, the motion of waves, their swaying and breaking against the pier. “I wish to approach truth as closely as is possible,” says Mondrian, “therefore I abstract everything until I arrive at the fundamental quality of objects.” In this way, Ocean 5 is much less about description than it is about function; if one were to draw blueprints or schematics for the structure and design of the sea, Mondrian argues that it should look just like this. Are you buying it? I’m not so sure myself. Supposedly ol “Pier” first sketched his Ocean series while looking down at the sea from sand dunes, which could have helped give him such a unique perspective, revealing the ocean’s apparent functionality. I’ve been to some sand dunes myself, but all I saw was a lot of cold water I didn’t want to get close to. Maybe it’s plausible. Maybe he just had a lot of free time to kill waiting for the war to end and his dad to die. Whatever you believe, Mondrian didn’t stay focused on the sea long enough to elaborate. Eventually, he developed his non-representational form “neoplasticism” (white background with a painted grid of vertical and horizontal lines and three primary colors), the work he is arguably most known for today, and never looked back.